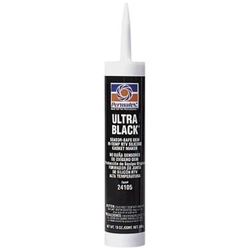 Ultra Black® ensures extended drivetrain warranty compliance. Fast-curing formula. Sensor-safe, low odor, noncorrosive. Meets performance specs of OE silicone gaskets. Retains high flexibility, oil resistant properties through use of a patented adhesion system. Temperature range -65°F to 500°F (-54°C to 260°C) intermittent; resists auto and shop fluids and vibration.